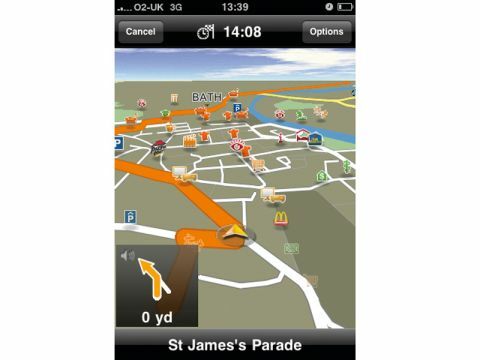 GPS navigation on your iPhone – it's finally here! At last, GPS for the iPhone is finally here! Thanks to changes to the terms of the iPhone SDK, we can finally add to the long list of devices the iPhone can transform into, like a satellite navigation device with software like Navigon MobileNavigator Europe. Navigon might not be as recognisable a brand as Garmin or TomTom – whose as-yet-unreleased app and cradle set was demoed at WWDC – but it has a good pedigree. It contains maps for the whole of Europe – a UK-only version is available for £53 – so is a hefty 1.65GB. Before we pick away at the edges, it's worth saying now that it works. The overall feel is, while there's room for improvement, Navigon has put a lot of effort into getting things right; the iPhone display toggles happily from portrait to landscape, and you can easily navigate to your contacts list. So, the problems. Some are not the fault of the app; you'll need a cradle like Griffin's WindowSeat, and the iPhone's speaker is a little distortion-prone at sufficient volumes for the spoken directions. GPS plus the always-on screen eats battery life so you'll need a power adaptor. There are some niggles: you can start music playing before launching the app, but it won't duck to let the spoken instructions stand out, and street names aren't displayed in the 3D view. More seriously, you can't do full UK postcode lookups, and there's no support for traffic updates, something that could easily be added (presumably for a cost) through the iPhone's data connection. Requires iPhone 3G or 3GS.